Hardy Everbearing Fig | Gurney's Seed & Nursery Co.
Often Bears Fruit in the First Year! Why wait for delicious meaty figs? This versatile dwarf not only bears its sweet, 2 in. long fruit often in the first year, but it will thrive indoors or out. The glossy green tropical-looking foliage looks magnificent on a patio or move it indoors to grace a sunny spot in your home. Grows 12-15 ft tall with a slightly smaller spread. Foliage3 to 5 lobed medium green, coarse in texture. Flower FormInconspicuous flowers (hidden inside the bud). 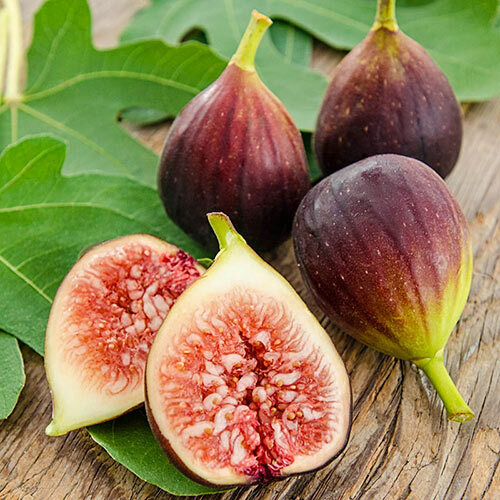 CommentsEnjoy tasty figs with dark mahogany skin and rich red flesh. Good for eating fresh, baking, preserves or dried fruit. In northern climates, plant in a container on the patio and move indoors for the winter. When the fruit is fully ripe and at is peak for eating, shipping them to the grocery is difficult. Every summer you can walk out into your own yard and enjoy them right away in mid summer and again in late summer to early fall. Figs are self fruitful, no need for another to pollinate. Good for fresh eating, baking, preserves or dried fruit. DepthPlant at the same level as n the pot.